In my ‘Summer Skincare Routine‘ I briefly mentioned this Vitamin C facial wash. I kept putting off talking about this product because I needed some more time with it. I judged it too quickly and then I had to go back and start from scratch and really get to know this vitamin C facial wash by Soap and glory. I LOVE Soap and glory. I think their skincare is amazing and i literally recommend everything they do to everyone. A few weeks ago I was doing some shopping and decided to pick two bits I was desperate to try, one was the no clogs allowed and that has its own review that you can check out here. I was excited. I know i know i know, it’s just a face wash but you don’t understand when i say I LOVE soap and glory, it was something i had wanted to try for so long and finally i got my hands on it. Something i also love about soap and glory (i also love this about Aussie products) is the writing on the packaging. I don’t mean the font but, the little quirky things they put in there. It isn’t a make or break kind of thing for me but it makes me smile and just love the product a little bit more. It’s almost as if they are talking to your directly, despite selling it to everyone it makes it a little bit more ‘mine’. I hope someone understands what i am trying to say! Anyway, my first impressions were good. A blue facial wash is always good, i could see little pink beads floating around, funny little quotes on the packaging and the promise of ‘super clean and fresh and bright skin’. I cannot lie. I love doing reviews to much to start lying but, it actually burnt my lip. How? I have not one clue because it absolutely never ever happened again, but the first time i used it, it burnt my lip. You’re of course not meant to touch your lips but accidents happen and as I was fighting through the pain (okay maybe it didn’t hurt that much!) i really didn’t feel like it was my fault. For whatever reason something inside this little blue bottle of facial wash made my lips sting but, like i say it has never happened again. Aside from the burning, i loved the actual soap and glory facial wash. It made my skin feel so nice, the little pink beads felt like they were really scrubbing my skin and it did seem to make my complexion look brighter and a lot fresher. This is the part of anything that i hate. Explaining the smell. My brain just won’t do it and i can’t understand why the words don’t translate out of my head. 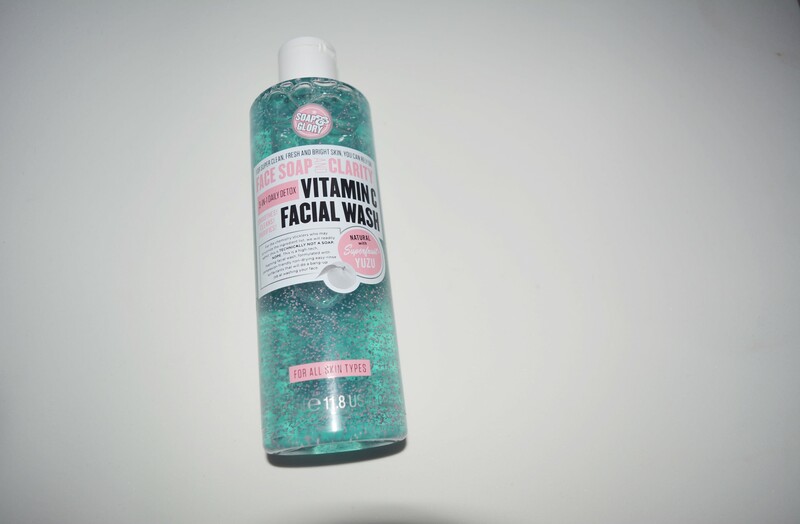 Basically it smells like mint, freshness and it also says it contains the superfruit ‘Yuzu’ so, if you know what that smells like then you can imagine what this vitamin c facial wash smells like. I really love the smell as it just smells ‘clean’ and i’m kind of obsessed with ‘minty’ smells so for me it’s gorgeous. Firstly, of course it did sting me. I say sting because it was more of a sting less of a burn, i did exaggerate slightly. Luckily, it didn’t put me off because well, pain is beauty but it could of easily mislead someone and made them quite angry at soap and glory. I’m not that kind of person but, people can be and for whatever reason it stung my lip, it may sting others. Secondly, I am not a facial wash expert nor am I any sort of expert in any dermatological field but, it is called ‘Vitamin C’ facial wash and although i don’t understand the majority of the ingredients there’s no tell tale sign of where the vitamin c comes from. Does it come from the superfruit yuzu? or is it just infused with vitamin c? I honestly, hands down have no idea. I wish it was stated somewhere something like ‘from real oranges’ or ‘natural source of vitamin c from our superfruit’ but i can’t work it out. I am probably being really dumb and disrespectful to the makers of the vitamin c facial wash so if absolutely anyone knows please let me know where it comes from because I really am intrigued. Overall I honestly did LOVE this facial wash. I use it every single night and it makes my skin feel amazing right before bed. It makes me feel like my skin has been under a face mask when I wash it off and although i was a little put off by the price, it has lasted me absolutely ages and it doesn’t even look like I’ve made a dent yet! I didn’t like the stinging sensation on my lips when i first used it but, i shouldn’t of accidentally got it on them and it never, ever happened again. The Vitamin C source is an issue that is just something I noticed and speculatively wondered because i have a feeling it’s me being a little dim and missing the whole point. You Can Check Out The Soap & Glory Facial Wash Online By Clicking Here If You Are In The EU or Here In The US! Anyway! 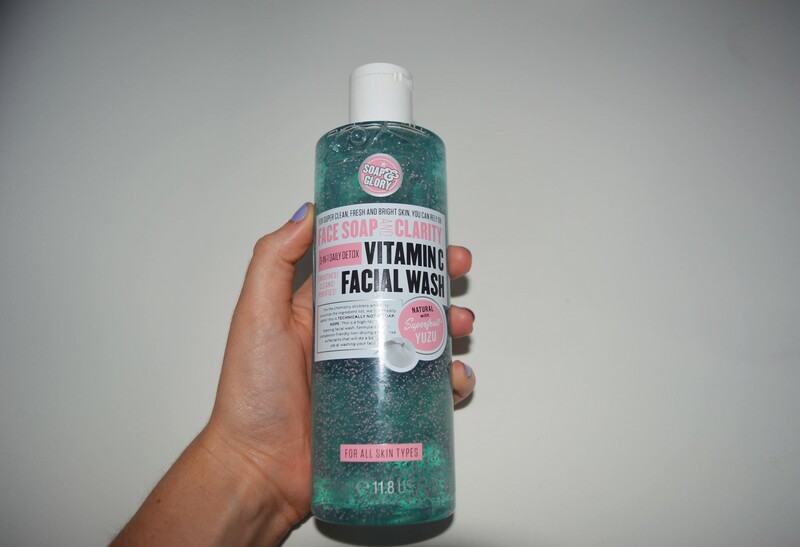 I really hope you enjoyed this soap and glory mega review, if you did please let me know in the comments below and let me know what you think of this Vitamin C facial wash!